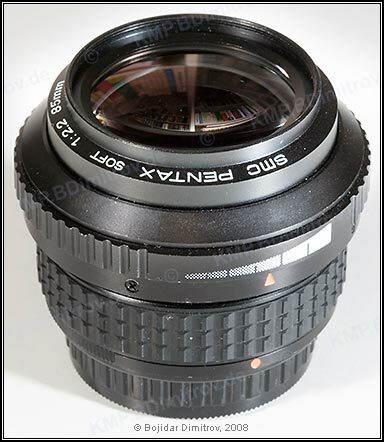 This is an unusual lens: the images that it produces are quite unique, its aperture range is uncommon, and its appearance does not quite match that of the other Pentax lenses. The main use of the 85/2.2 Soft is portraiture. Its optical formula is designed so that the image gets softer as the aperture gets wider. In other words, the aperture ring controls the aperture setting and the image sharpness. At f/2.2 the lens is at its softest while at f/5.6 it is already quite sharp. The center of the image is always sharper than the corners. The aperture ring has no click-stops, so the image sharpness can be precisely controlled. The images produced by the 85/2.2 Soft are very pleasing and quite unique, even compared to other soft lenses. The diaphragm coupling in this lens is fully manual &#8212 a desirable feature for a soft lens. The reason is that, due to the connection between aperture and image sharpness, the sharpness of the viewfinder image matches exactly that of the final image. Furthermore, selecting the desired amount of sharpness forces the use of a particular aperture value. In order to achieve proper exposure then, the photographer must change the shutter speed (which may not be possible in all cases). The lens is reasonably light an compact, and handles quite nicely. It takes a bit of getting used to it, however. 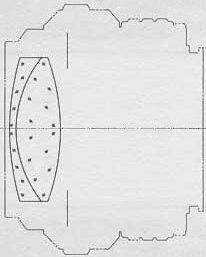 The focusing ring is quite narrow and is positioned directly in front of the lens mount while the aperture ring is in front of it. Because of that, bodies with optical aperture read-out will not be able to display the aperture in the viewfinder. As intended, the lens is very soft wide open and quite sharp stopped down to f/5.6. Its contrast is quite good, the colors are nice and bright, and distortion is well controlled. The bokeh is quite pleasing.